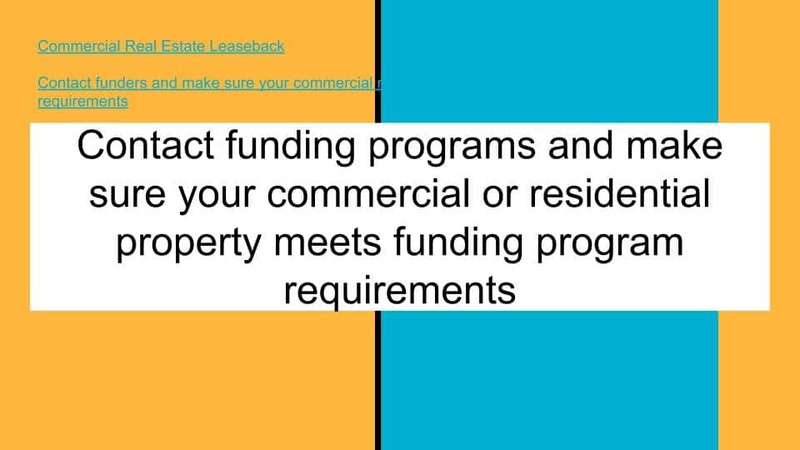 A Real Estate Leaseback is a loan against Real Estate. The owner of the Real Estate can be an individual or business. The Real Estate is sold then leased back, allowing the owner to obtain capital and complete a leaseback Real Estate. 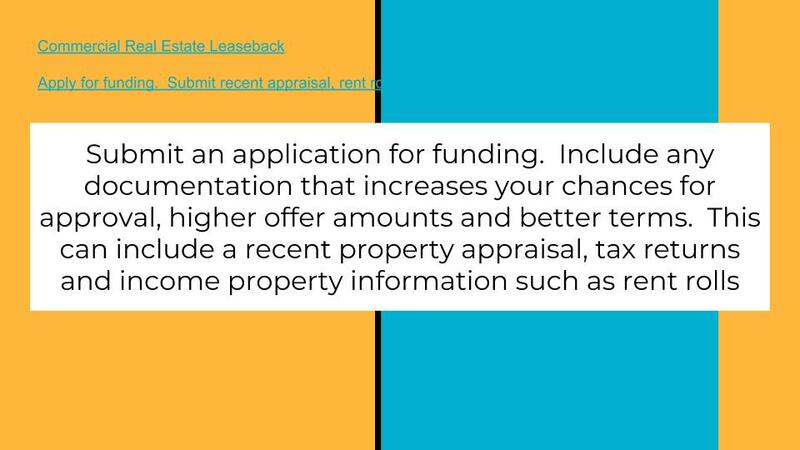 A real estate leaseback, versus equipment leaseback, is typically a better choice if the most capital possible is needed. The loan and leaseback against real estate will usually provide the most working capital. this as a “Loan on Commercial Real Estate”. Regardless, in this transaction, real estate is sold for cash, with a lump sum of cash going to the seller. The real estate is leased back with a purchase option at the end of the term. The seller remains on the property during the entire term of the transaction. Complete the Secure DocuSign 30 Second Loan on Commercial Real Estate Application Now. Callers call in with different requests. Callers will ask for a Real Estate Leaseback, or a loan against real estate, or a loan against commercial real estate. They will also ask for a commercial real estate leaseback and to leaseback commercial real estate. 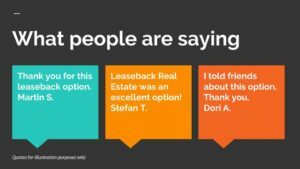 How to get a real estate leaseback. Steps, direction and tips. 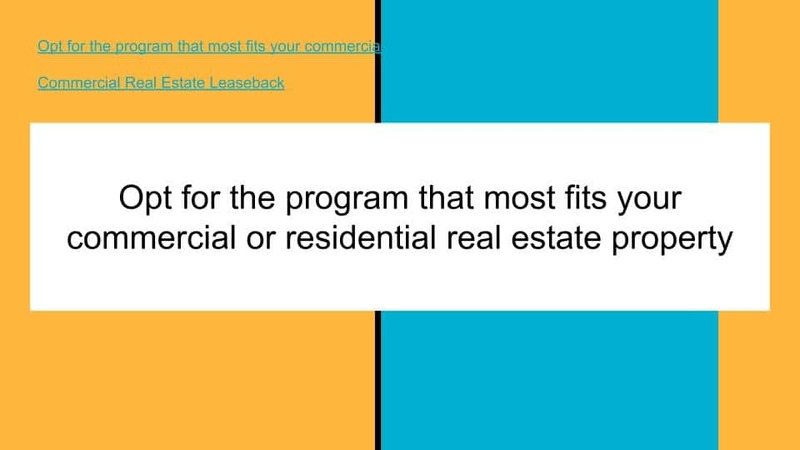 Research companies that have commercial real estate leaseback and residential real estate leaseback as primary programs. Consider minimum funding amounts, rates, LTV loan to value requirements, and types of property that qualify. Also review total processing time from application to funding. Minimum loan amounts are usually $100,000. Most programs are against commercial property. Requirements often vary state by state depending on state real estate laws. Some programs may not be available in all states. 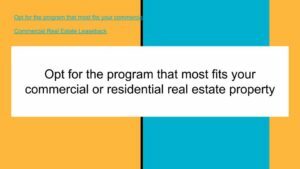 Opt for the program that most fits your commercial or residential real estate property. You want the program that is going to be the best option for your commercial real estate. 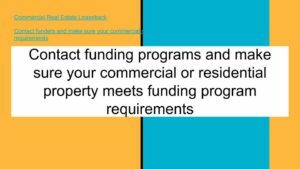 Contact funding programs and make sure your commercial or residential property meets funding program requirements. Make contact and discuss your commercial property. Try to assess whether your property meets funding program requirements based. Submit an application for funding. Include any documentation that increases your chances for approval, higher offer amounts and better terms. This can include a recent property appraisal, tax returns and income property information such as rent rolls. Apply for funding. Provide any information that makes your request stronger. With any real estate leaseback offer or approval, review the term sheet provided that includes conditions and closing requirements. If satisfied, provide items required for closing and funding. Borrowers paying for an updated appraisal and other closing costs is standard. Complete the transaction and receive funding. Question: How can i get a loan on my real estate? Answer: You must have residential or commercial real estate with a loan to value of less than 70%. You must also be on the deed. Any liens on the property will go against the 70% LTV, also known as loan to value. Question: Can I get a loan against my residential real estate or only commercial? Answer: You can get a loan against either residential or commercial property. Question: What if I am behind on my mortgage? Can I still get a loan against it? Answer: It depends on how far behind you are. If you are less than 60 days behind you should still be able to get an offer if you meet the other conditions. Question: Can I payoff my merchant cash advances with my real estate? Answer: You can use your commercial or residential real estate to payoff your mca merchant cash advances. If you have at least 50% equity in your real estate then you have a good chance of being able to use it to payoff your merchant cash advances. Approvals are more likely and for more money when you use your real estate. If your business is suffering from merchant cash advances use your real estate for a fast and effective solution. Question: I need money against my real estate fast. How long does it take? Answer: Funding can be as fast as a few days. In most cases it will be two or three weeks. 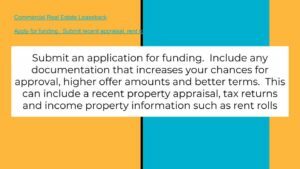 If you have a recent appraisal then funding can be fast. Question: What are the terms and rates? Answer: Rates are in the high single digits to low teens. Terms can include early payoff in 12 to 24 months. The minimum dollar amounts on a Leaseback Real Estate is $100K with a maximum of $5,000,000. Since the average property size is $250K and up, the funded amount on a Leaseback Real Estate will typically be $100K to $250K minimum, where as the average size loan on equipment is in the $50K range. Loan to value, also known as LTV, will vary somewhat depending upon credit and the financial position of the seller. The maximum loan to value is usually 75%. The property in a Leaseback Real Estate will contain a structure in addition to the land. The structure can be either a free standing commercial building, or affixed to part of a larger structure. A strip shopping center is an example. Other acceptable property types are apartment buildings, gas stations, convenience stores, office buildings, restaurants, and industrial plants. Whether the structure is included in the transaction is at the discretion of the lender. If the value of the structure is minimal, the lender may decide not to include it in the transaction. Even though real estate values are still recovering since late 2008, this form of financing still has many strengths and opportunities. Real estate values have increased significantly in several markets in the United States. For many market locations, values have not recovered as dramatically but this form of financing is still viable for many borrowers. If the potential borrower in a leaseback real estate has significant equity, the strong equity position insulates them from market fluctuations. This increases the prospects for approval for a significantly higher funding amount. Our representatives will discuss the details of your scenario with you. You will understand and proceed on the most viable and best form of financing based on your situation. This form of financing can be especially effective for businesses in need of significant funding amounts, without as many of the extensive requirements of traditional financing. Businesses in need of working capital will obtain a greater result by using their Real Estate for their business rather than simply owning Real Estate. Terms will be significantly shorter than traditional Real Estate Financing. Terms are usually 5 – 10 years. This will allow the Seller to fully re-acquire ownership of the Real Estate. At that point, they can retain full equity, or consider another Leaseback Real Estate for additional working capital for their business. Our experienced industry professionals, experienced in both Leaseback Real Estate and a Leaseback using Equipment will quickly guide you through the process. Leasebacks involving equipment or vehicles bring in revenue into the business. However, using real estate will bring in the most capital into the business by far. The borrower can expect an environmental survey to be required. The cost of the survey will normally be $500 to $1,000. A real estate leaseback can bring in millions of dollars in comparison to an equipment leaseback. An equipment leaseback usually generates only tens of thousands of dollars. Corporations that have over $10,000,000 in sales per year or higher should first review their real estate holdings to determine which financing type would be better suited for their needs. 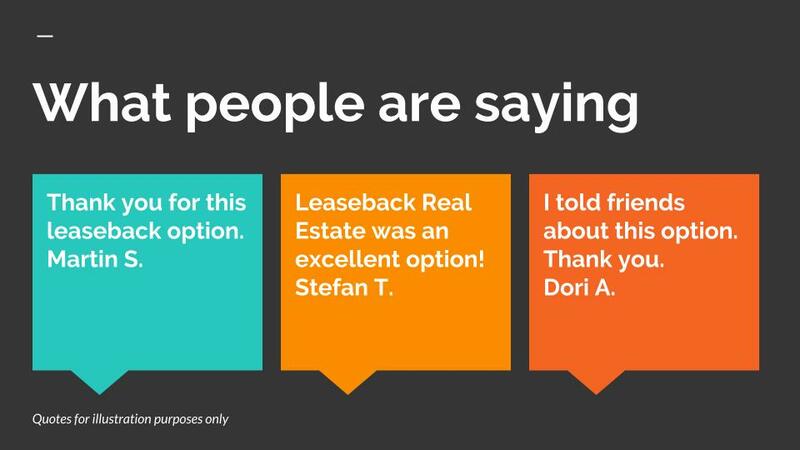 Thank you for visiting our Leaseback Real Estate Resources page! Previous PostPrevious Will Supercommittee failure spook markets?